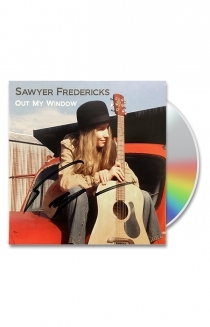 Out My Window is Sawyer's first CD, Independently released in June of 2013 when Sawyer was 14 years old. Out My Window features all Original Songs written and performed solo by Sawyer. Out My Window's 15 tracks include the Original version of Not My Girl which Sawyer re-recorded with his Touring band and released digitally in 2016. If you have caught Sawyer in concert or on his A Good Storm or A Winter Storm Tour, than you might have heard Sawyer perform updated versions of the title cut Out My Window or Afraid. Out My Window was recorded at age 14 before Sawyer's voice dropped 2 octaves. On Out My Window Sawyer sings with what he has come to call his, "Angel-Boy" voice. The Vocals and guitar work are soft and mellow and the lyrics are pure Sawyer Fredericks, insightful poignant and deep.